In January 1931, Anne was living with Claire, who had some limited correspondence with Florence, Anne’s mother. The period from 1923 to about 1930 was quite difficult for Florence, but the detailed information is a little scant. The details are probably available in her voluminous correspondence and notes (much of which my mother still has), if I wanted to make it my life’s project to sort it all. Throughout the early 1930s, when even able-bodied people were struggling to make ends meet, Florence had to move around from rented room to rented room. In later years, she happily recounted most of her life with a crystal clear memory but those years, before Anne joined her, remained somewhat confusing to me. 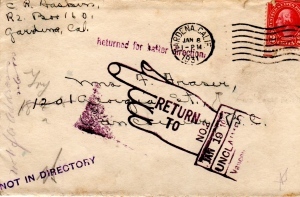 Here is an envelope that was returned to Claire, Anne’s guardian. In the envelope was a note thanking Florence for a and a bookmark that she had sent, possibly for Christmas. It seems that the letter eventually reached Florence, since it was found in her possessions. I am impressed by the bold and dramatic stamp. 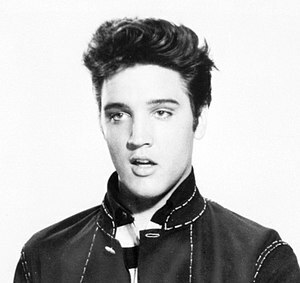 It is almost as quaint now to listen to and watch Elvis singing Return to Sender in 1962. Wasn’t she in an institution for the blind for a while?